3.2 Euro MAHLE P&Cs will replace the US models. Slippery slope continues. While were in there new timing chains and sprockets have been added to build list. Looks like SuperTec head studs will replace the stock, in great shape studs. Is the engine case opened? Reason I ask is because if you're replacing timing chains and cam sprockets, the lower sprockets inside the engine case (they're on the intermediate shaft) and the sprockets on the chain tensioner arms should be replaced as well. New chains like new sprockets at both ends and in between. It's not the end of the world if you don't replace the lower sprockets. Just saying it's technically the proper way to approach the chain & sprocket assembly. Be sure to have the shop look closely at your fan ring. The 3.2 fan rings are most prone to breaking because the alternator body got bigger in the later cars. When the alternator body got bigger, the center of the ring got thinner and weaker. Take a good look at your clutch. If it's got a rubber centered disc, replace it. Yes. Bottom end is open. Crank, rods etc... at machine shop for a little love. All new bearings going in. I assumed the sprockets on ims will be part of the lower end kit but Ill ask to be sure. THX. Clutch has about 20k mi on it and looks great. That will go back on. Dropped off seats at Upholstery shop yesterday. Super excited. The Marina Blue leather is stunning on this Grand Prix White Cab. After 30 years the bolsters (drivers side) were shot and the passenger side seat bottom had a cut. Time to replace. Hope to have her back before Turkey day. Once back I plan to (DIY) the suspension and brakes, then off the alignment and corner balance. Darin at West End is my go to. Anyone have feed back on 3.2 Euro Mahle vs US spec. Any concern using higher Euro compression on CA 91 street gas? Well, after talking this over with Steve Wong and Vertex engine builders, and a few others I have decided that the Euro 3.2 MAHLE higher compression P&Cs will be returned and US spec P&Cs will be installed. With CA smog requirements and 91 octane gas only for my DD build the cons of higher compression far out weigh the pros. Compression ratios over 9.8:1 require either twin-ignition or unleaded race gas. Without either one, you'll face broken rings and trashed pistons from detonation. BTDT,.....SOOO many times. 93 octane fuel is not sufficient. Last edited by 996AE; 11-12-2018 at 04:02 PM..
Well, with holidays, Rennsport, SEMA and machine shop delays my 4-6 week engine build, well, is a much longer build. Good news is I will pull the car out of the shop tomorrow and off to mancave for suspension refresh and some detailing. Al Reed re finished 7&8 (930 finish) with new Michelin AS tires will be added. Turbo tail off and flat deck lid (factory order) going back on. Seat are done this week so hope to install them as well before returning for new bottom up engine rebuild and install. Like all remodels twice the time and twice the money. That said should be a great driver for my small fleet of fun cars. You should reconsider your Mahle P/C set and get more info first. When you CC it all out you'll likely find that the compression Ratio is not near the 10.3:1 quoted, but more like 9.6:1 with a Head that has not been cut many times when a valve job was done, meaning Head CC's are in the 90-92CC range as is average). Similarly, when you CC out your USA spec piston, the compression ratio will be in the 8.9-9.0:1 range, which is pretty weak. 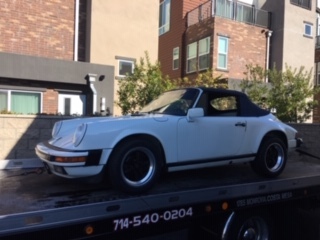 even for 91 octane we get here in Calif. Never heard a great explanation as to why this is, but this is often the result when you CC out the stock Porsche P/C sets, another example a 964 3.6 rated at 11.3:1 is actually closer to 10.5. Any credible engine builder you can trust would have learned this and you should get that done(starting w the Euro set first) to see where you are at, think you'll be happier w more umphff. Know you ruled them out before over price, but you might now want to reconsider the Mahle motorsports 98mm wedge-shaped single plug p/c set -- which would get you an advertised 10:1 cr (likely lower when you CC) and, by increasing displacement to 3.4l, would also give you an appreciable power bump. OR -- get your existing cylinders bored to 98mm to fit new mahle motorsport pistons (or other "max moritz" single plug copies) Middle Ground? For a DD and a layman at that when it comes to engine building I went the safe route and did return the Euro P&Cs for US Spec. I will run sport exhaust, no cat and Wong chip. Slippery slope but log term reliability and smooth, dependable engine build was/is the goal. Gee, I hope your suppliers didn’t read this (if you care). Builders have re-ringed good Alusil cylinders with good results - some not so. So I understand the builder’s preference for predicting positive end results with minor risk. A DiYer has that same dilemma at the risk of their own $$ and labor. Porsche and budget when rebuilding a 911 motor somehow never quite together. I opted for the 12 month motor guarantee which re ringing wouldnt have recieved. And in CA with the stringent smog rules I took the safe route. Good news is with everything balanced, polished, ported etc.... should be better than new. Again, not a engine builder so I am trusting the shop. Great guys and I am following their lead and recommendations. Besides the 6 week build now looking like 12 weeks from what I am learning we are right on schedule. Heads are done. Tins all powder coated. New MAHLE 3.2s balanced. Just waiting on oil pump and balanced and polished crank. Hoping the assembly starts next week. In the meanwhile I picked up the car and its in the mancave for detailing. Seats are back from the upholstery shop and looked fantastic. 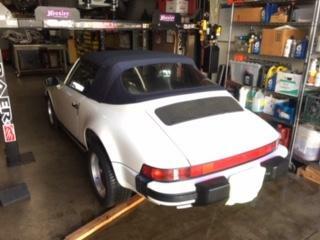 Last edited by 996AE; 12-13-2018 at 07:09 AM..
Whale tail (Turbo) off and new decklid installed. Never a fan of the turbo tail on narrow body cab. Besides it wasnt on option list so off it went. Only change from stock is the white option coded fuchs 6 and 7s are off and turbo finished black center 7&8s going on with new Michelin AS tires. Car on rack this week at cave. Years of oil leak clean up this week. Cant install motor into a dirty engine bay. New shocks, rear brake pads and rotors, swaybar bushings, sound pad along with axle boots complete the rear. 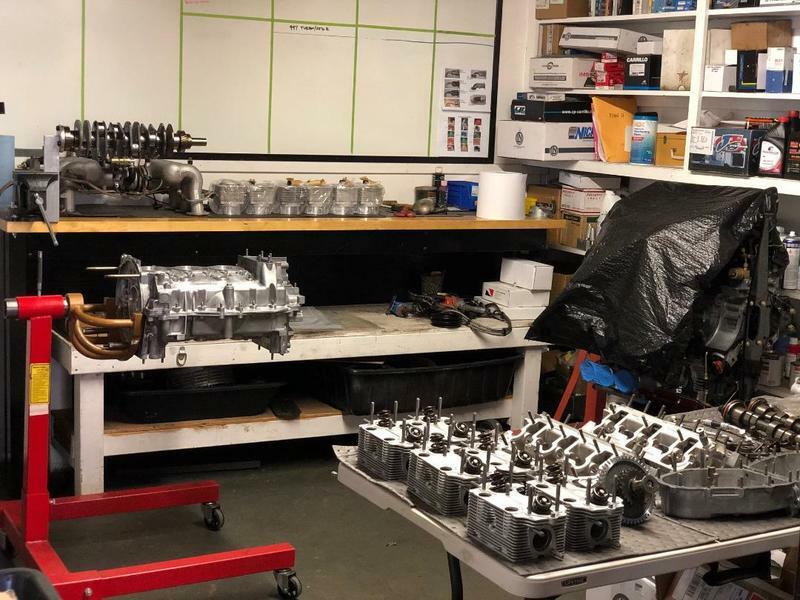 Sleepers Speed Shop hopes to have engine build completed by Christmas. I'll post a few engine assembly pics next week. Car is looking good and ready for new engine. 7 and 8 Fuchs, turbo finished with new Michelin Pilot Sports 3 A/S mounted replacing the Don Johnson Miami Vice White 6 and 7s. Under belly cleaned, engine bay detailed and new seats installed. Just need an engine for Christmas. PS. Heads back from Machine shop but "rototating parts" are delayed, again. Christmas not likely. Darn. Car is headed back Sleepers Speed Shop tomorrow. Hoping to get an update on engine build time frame when I drop her off. Looking forward to hearing it run and finding out how you like it. All we need it the machine shop to deliver our rotating parts. Holidays have pushed us way behind original build date goal. Sleepers Speed Shop promised me a few pictures of the heads and the pile of shiny new parts. Ill post a few. All parts back from Machine shop. Four new axle boots kits installed and rear sway bar cracked bracket replaced. Clean room holding all the new and machine shop engine parts assembled and tagged for build start this week. For those that have tackled this bottom up build I know you can appreciate the time and care going into checking, double checking and checking again before assembly starts. 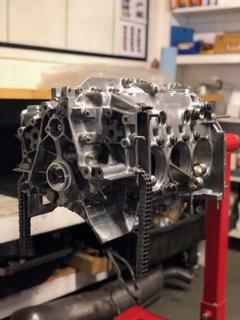 Sleeper Speed Shop tells me their goal is to get the bottom end buttoned up this week. I'll post pictures when they do.